In the heart of Sleepy Hollow, at 1317 Butterfield Road, is our Community Center Clubhouse and Pool. For more than 60 years, these treasured facilities have been the scene of countless events and gatherings that make Sleepy Hollow the friendly, fun-loving place we call home. Recall, for example, the annual July 4th festivities, championship Swim Team competition and summer evening poolside socials for all ages. The clubhouse is home to scouts, civic committees and boards, fire safety training and disaster preparedness staging provided by the SHFPD, and is our polling place. At times the building has hummed with exercise classes, children’s team building events and parties, and special holiday events. It is also offered to rent on a space available basis for family celebrations, dinners, dances, classes, etc.Inquire here about rentals. A Community Center is Part of our Charter. Now it is our turn to carry it forward. The SHHA Articles of Incorporation provided for the construction, care, and improvement of facilities to build community and help our community play and work. Construction of the Sleepy Hollow clubhouse and pool began in 1950 and was completed in 1956, with the generous contributions and volunteer labor by the men, women, and children of Sleepy Hollow. Featured in a Sunset Magazine article of November 1956, the SHHA clubhouse became a model for other Bay Area communities. View the Sunset Magazine article. The full spirit and cooperation of the homeowners of the 1950’s became the inspiration for the remodeling and renovations of the clubhouse in 1985. Today the clubhouse and its huge beamed hall and grand old fire place are the keeper of over 65 years of shared laughs and loves, joys and jigs, toils and tributes, and dozens of bins of well-used decorations from celebrations and competitions past. Almost forty years since the last “reboot,” we are once again rallying to the care and improvement of this treasure. 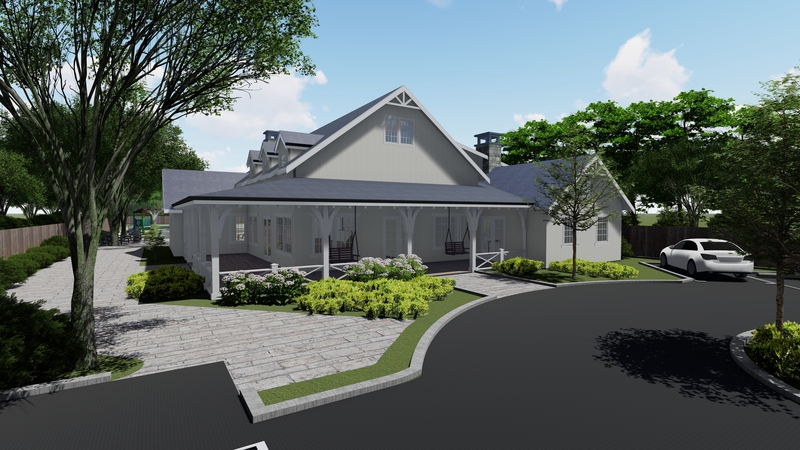 Construction begins in April 2019 to build a new Community Center, a value to current and future Sleepy Hollow families, continuing the traditions of community gatherings, and adding to the activities and events of interest to residents. Now we come to the second phase of community engagement and leadership to raise the last funds to build our new Center. Tax deductible donations can be to the Sleepy Hollow Charitable Foundation, a 501(c )(3) public charity. Your pledge may be paid over 2018, 2019, and 2020. And donations can be made in cash or securities.Read more about the SHCF and how to pledge and donate. The new Community Center will be home for the Sleepy Hollow Fire Protection District and its tireless work on our behalf to reduce the risks of fire, increase our preparedness for a fire or other disasters, equip us with evacuation skills and smart behaviors, and to be a safe haven whenever needed. Visit www.shfpd.org for a complete report on their year-round activities. The new Community Center building is set back farther from Butterfield for safer pick-ups and drop-offs. It features a main floor with a gathering room and classroom/meeting room open to above, and a half second level with flexible rooms for fitness, or small classes and practice rooms, plus the offices and storage space for the Fire Protection District. The highest point of the roof is 29’3” above grade, and window placements and heights protect the privacy of neighboring homes. A veranda wraps the street and south sides, with double doors opening to the gathering room. Xxxx square feet of space on the main floor is adaptable for many uses and more than one activity, group, or event at one time. The large gathering room welcomes neighbors for informal, small get-togethers, space for cards and other games, coffee with friends, and more, and can also be arranged for community get-togethers and events of interest to residents. An alcove offers another nook for conversation or games, musicians, or the often popular coffee maker. The meeting room/classroom is for board meetings, civic groups or committees, lectures or classes of interest to the community; use by the SHFPD for training, classes, its meetings and other needs, and can be cleared to allow flow from the gathering room for community gatherings. A library/small conference room allows conversation, meeting with a client, quiet work away from home, games, or small group meetings. The kitchen will be a “reheat kitchen” equipped with ovens and easy to use by the SHHA and community groups or potential renters. The bathrooms and locker rooms will be all new with showers. 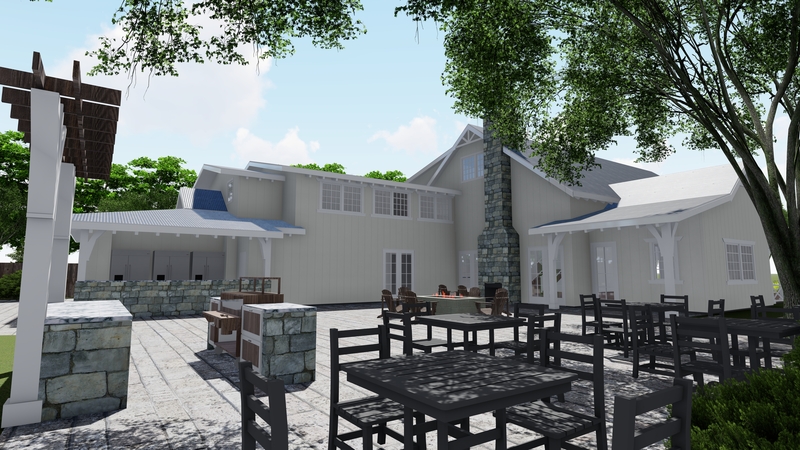 An open patio is available through the gathering room doors on both sides of the fireplace, from the new snack bar, and from the main walkway from the front gate. Set back farther from Butterfield for improved pedestrian, bike, and driver safety, the site offers indoor/outdoor socializing with open areas, verandas, and double doors from the gathering room. The old snack bar will be removed (we expect to use the appliances), allowing more space for the open patio. The proposed new pool pump building will be deferred, and the old pump building will continue in service. The proposed array of outdoor showers will not built at this time, allowing more space for a playground that is visible from the pool area, the snack bar, and the open patio. The Community Pool will be open throughout construction for family swim season, swim lessons by MAA, Inc., and the Sleepy Hollow Sea Lions Swim Team and Pups programs. A new treasure for Sleepy Hollow will open its doors for the summer of 2020. Planned for community use and events of interest to the community, it will also be available for rent on a limited basis. Now it is up to you to paint the pictures of what you would like to do and see in these spaces. Learn more of the history and process of the efforts that have been underway and accomplished since 2011, when repair and rebuild assessments were first made. Visit the Sleepy Hollow Charitable Foundation for project details and how you can help, including pledging and donating.